Apple has officially releases its WWDC 2013 iOS App for iPhone, iPad & iPod device users to get all latest updates, news, announcements, important notifications, session videos, keynotes, passbook support, find locations via maps, providing feedback, daily snapshots, full event schedule and much more under one iOS App. The WWDC 2013 iOS App is very useful for those peoples who are going to attend the main event in San Francisco, USA at Moscone West Center on Monday, June 10, 2013 at 10:00 AM PDT (13:00 PM EDT, 18:00 PM GMT) and it’s also useful for those are not going to attend the main event but wants to get all latest updates and happening of event. As we all know that Apple is going to announced and revealed the upcoming iOS 7 Firmware for iPhone 5, iPhone 4S, iPhone 4, iPhone 3GS, iPad 4, iPad 3, iPad 2, iPad Mini, iPod 5G Touch and iPod 4G Touch devices and will also introduced Mac OS X Mountain Lion 10.9 Version so everybody should get connected via Apple's WWDC 2013 iOS App. 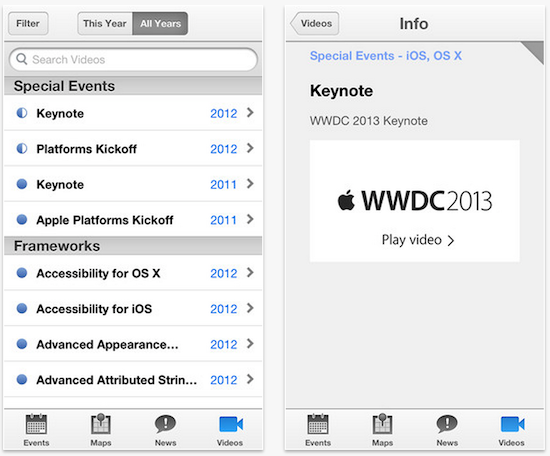 How Apple's WWDC 2013 iOS App Look Like? What Apple's WWDC 2013 iOS App is Offering? Get Official Live Streaming Coverage of Apple's World Wide Developer Conference (WWDC 2013) Event from following Live Stream Video Link and get updates, announcements and news directly from WWDC 2013, Moscone West Center, USA.